Everyone loves a ‘local boy makes good’ story, so this should make some readers ecstatic. Britton, Michigan native Duane Below made his Major League debut Wednesday night against the Oakland A’s at Comerica Park, about an hour away from his home town. The Tigers lost 7-5, but Below pitched well in his first game and gave his team a chance to win. He threw five innings, giving up three runs on five hits, but only one run was earned. He also had two strike outs in the game. Below seemed pleased with his performance, though. I love it when players sound like little kids when their dreams come true. We were lucky enough to see Below pitch when he was with the Whitecaps back in 2007. The game was a sell-out at the time, with a local boy on the mound, and the ‘Caps picking up an 8-4 win over visiting Fort Wayne. Below also pitched five innings in that game and gave up one run. 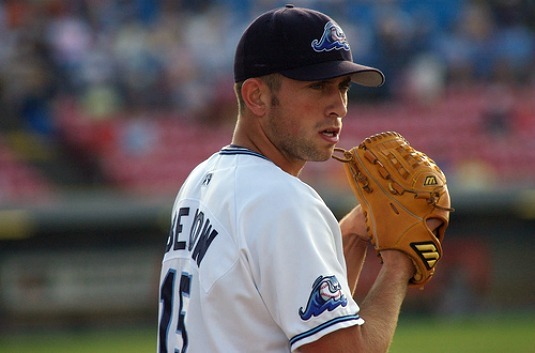 He posted a 2.97 ERA with West Michigan in 2007, and had a record of 13-5. 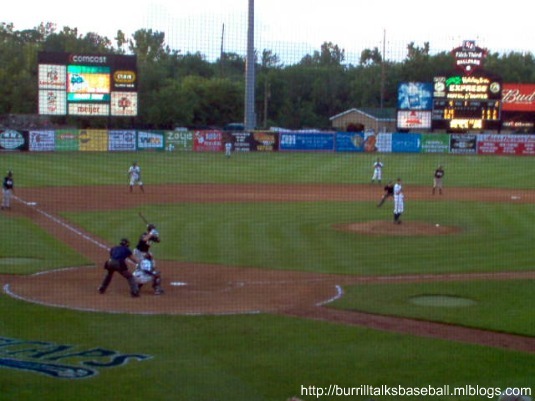 He was named the Tigers Minor League Pitcher of the Year and the Whitecaps Pitcher of the Year after leading the Midwest League in strikeouts with 160 in 2007. I was able to scrounge up a couple of pics from that game before my MLBlog days, but nothing real good of Below. Now-former Whitecaps pitcher Antonio Cruz was traded to the Kansas City Royals yesterday, in a deal that brought infielder Wilson Betemit to the Tigers. Lucky for Cruz, the Whitecaps were hosting KC affiliate Kane County Cougars, so he just walked across the field to his new dugout and team. He first joined the ‘Caps as an 18-yr-old in 2010, going 2-0 with a 2.79 ERA during ten late season relief appearances. This season, the left-handed hurler was 2-6 with a 3.11 ERA. At the beginning of the season he was a starter, but was moved to the bullpen to limit his innings pitched. With the acquisition of Betemit, former Whitecap and Tigers staple third baseman Brandon Inge has been designated for assignment and has reported to the Triple A Toledo MudHens. He needs to clear waivers next Monday, but Inge can’t really picture himself playing anywhere but Detroit. Inge is a fan favorite, and one of my favorites, but this had to be done. I wish him the best, and hope he can turn things around. Whitecaps game photo property of M.I.B. Thanks for sharing. So many of your posts include stories I wouldn’t be able to read anywhere else. Wow, I remember when Brandon Inge was, as you said, a staple of the Tigers. I really admire him for his loyalty to the franchise though. That’s somewhat of a rare breed in MLB, and I hope his perseverance pays off. Ron-thanks for the props. I try to do something different on here. Catherine-Loyalty is very rare in todays sports world, from either a player or franchise. Glad to see him sticking it out.